“If I only knew then what I know now”. That phase could easily sum up our experience with Sit Happens. Brad and I brought home our Husky puppy, Atka, at 8 weeks old. Since I was raised with a Border Collie, I thought I knew how to train a dog – was I wrong! 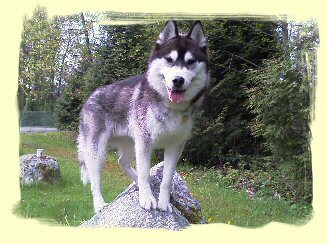 From the beginning Atka was a very social and independent dog. Walks became a negative experience since Atka would get overly excited if a dog were even a block away. To him, dogs equaled playtime, no matter what the situation. We usually came home from walks exhausted and had hands full of blisters from Atka pulling and trying to run everywhere. The walks consisted of us repeatedly yanking on the leash to get him to heal and get under control. We were told early on that Huskies are notorious for running away so we only had him off leash in the back yard and on leash for walks – not too much fun for him! We were signed up for puppy lessons but learned early on it was going to be a challenge. He totally understood all the commands, but the minute we took a break to listen to the instructor, Atka felt it his duty to introduce himself to the dog next to him and play. Atka was getting bored and becoming a distraction in the class so we ended up dropping out. Everyone told us Atka was going through a puppy phase and he would grow out of it, but his excitable behavior was starting to wear on our patience, and our poor guests. Atka would welcome you into our home with a running jump – not too pleasant in white pants! Our neighbor suggested using a pinch collar and I even went out to purchase one, but started to have second thoughts. I knew Atka was a smart dog and I should be able to control him in a better manner. 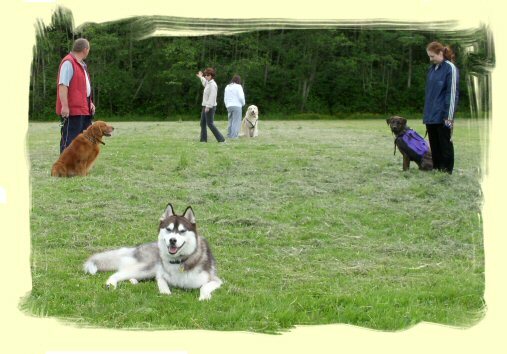 I spent a few weeks looking for dog lessons that would work for Atka and found Sit Happens. Since they did a free consultation, I thought there was no harm in seeing what they could do. Sit Happens came and talked to us about our concerns and within 5 minutes Atka was heeling and listening to them with no problem. “This is it!” Brad and I said to each other. Seeing someone control Atka, without yanking him all over the place, is what sold us. 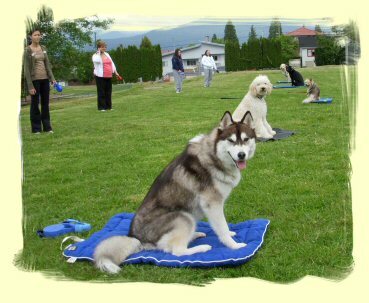 I was so nervous going to the first class – would Atka disrupt the other dogs the way he did in puppy class? Would we hold up the class? All my concerns were put to rest within a few minutes. Anytime we were having trouble, one of the instructors would take us aside and work with us one on one. They were so patient and understanding. After a few lessons and learning tools to help Atka, and us, we were able to have him off leash in a park and come when called! We couldn’t believe we had a dog that came when called and was under control around other dogs! Being able to find classes that fit our schedule, and continue to give us information to help us as he grew, was priceless. It’s been such a positive experience for both Atka and us. Everyone who has known Atka since he was a puppy always comments on how well behaved he is now and is a pleasure to be around. Taking Atka out is such a great experience and I rave about Sit Happens every time someone compliments him. They have made our pack very happy!